One of the best parts about being a Stampin’ Up! 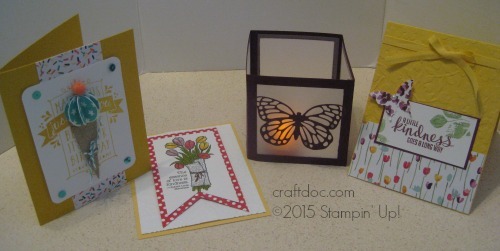 demonstrator is gathering together for fun sharing and stamping gatherings together. Here are the make and takes, and swaps from the last Erie Area Demo meeting at my house. I’d love to have you join my team and join the fun. There are extra goodies during Sale-a-bration. Details are at the Join the Fun tab at my website.